Curt Guyette is an investigative reporter for the ACLU of Michigan, which has been heavily involved in trying to fight water shut-offs in Detroit. Guyette’s work is funded by a grant from the Ford Foundation. 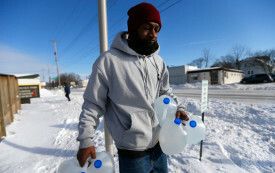 In Flint, Michigan, Overpriced Water is Causing People’s Skin to Erupt in Rashes and Hair to Fall Out. As the nation’s infrastructure falls apart, water is becoming more expensive and less safe.